hmmm, something to ponder indeed. 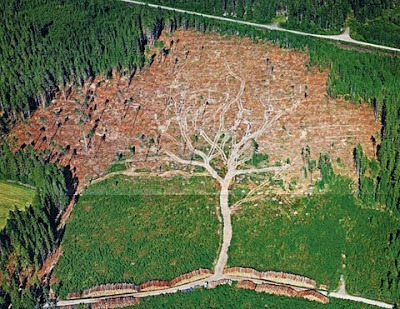 I'd bet dollars to donuts that, if it isn't faked, the tree image is an accident. That looks like a pretty standard clear cut to me. You've got the previous cut regrowing by the roadside and the branching access road heading inward to new timber. If it's not a fake, I'd say it's an ironic coincidence. It does make me marvel at the commonality of the organizational principles that govern both organic and inorganic structures. The branching, tree-like pattern was likely created by the same geometric rules that govern rivers, blood vessels, coral, and trees. Strange to find wonder hiding in something as grim as a clear cut. Nice find, thanks. Also, thanks for introducing me to Le Territoire des Sens. The tree image is certanly not fake! It has won a "picture of the year" award in Sweden in 2006 (http://www.airpix.se/). It is called "trädet" ("the tree") and was shot by Joakim Berglund. It shows the result after clearing up windfellings by the storm "Gudrun". Thanks so much for the info! I am happy to finally know the source of this wonderful image. It's also nice to know that it doesn't have to do with commercial logging. It's a very neat image and definitely deserves the award.